Crystal Clear Glass - Even In Bad Weather. Driving during bad weather conditions can be tiring on the eyes for the driver. In addition, pollutants washed out during rain, grit and oily grime splattered up from wet roads are pushed back and forth across windscreens during wiper operation. 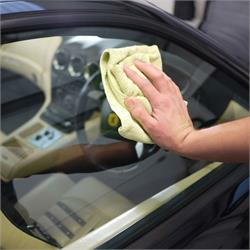 Wiper rubbers degrade and fine scratches are put into glass causing the windows to become hazy and smeary. Applying a hydrophobic, oleophobic (water and oil repelling) coating to windscreens can help limit the requirement for excessive wiper use. The effects of pollutants and contamination are also reduced as the coating causes rainwater to roll into beads on contact and blow away, taking away trapped dirt and greasy residues. The affect occurs even whilst driving at relatively low speeds. In addition, the hydrophobic action means snow and ice do not bond as fiercely to treated glass, making early starts much easier on wintry mornings. Crystal Clear Glass Treatment uses sophisticated nanotechnology-based coatings to guarantee better visibility in rain, sleet and snowy conditions, reducing fatigue and increasing safety. One treatment lasts between 20,000 and 30,000 miles. Pleasure doing business with you and hope to trade again in the future.